I his is the largest anil most heavily built of all the penguins. It puts on a deep layer of fat all over its stout body during the times of year that it spends feeding in the sea. Propelled by flipperlike wings, the Kmperor pursues fish and squid to depths as great as 870 ft (>(> 5 ill). On ice or snow, it walks upright or drops on its belly and toboggans along, pushing with its flippers. 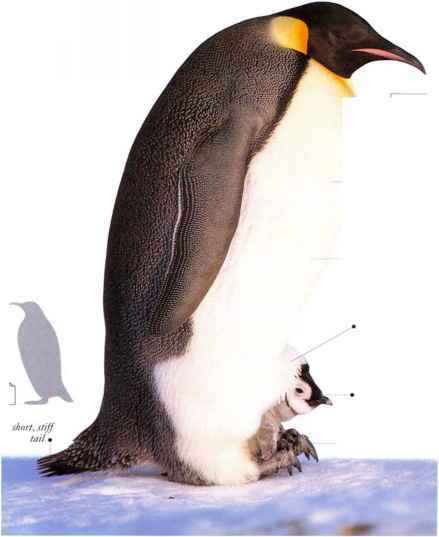 Kmperor Penguins breed in colonies on the Antarctic ice. each recognizing its mate or parents by individual variations in the nasal, trumpeting call. 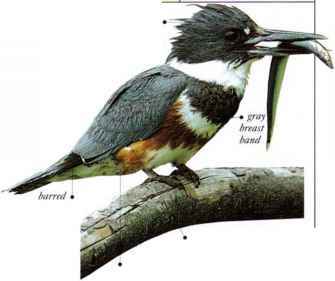 After pairing in early winter, the female lays an egg and leaves for coastal waters. The male incubates the egg for two months by standing upright and supporting it on his feet. Males huddle together for warmth through the blizzards of the polar winter. The female returns from the sea just as the young one hatches, and she feeds it with regurgitated food. The.male, having lost almost half his original «eight, then walks to the sea to feed for some weeks before returning to help rear the chick. • NEST No nest. The single egg, and chick, rest on the feet behind a fold of feathered belly skin.